Bubble Cap Column is a bell shaped cap which is fixed on the top of a cylindrical risers through which the vapor passes the tray deck. The cap column divert the vapor flow below the level of liquid on the tray deck where it is jetted into the liquid either through slots at the bottom of the cap or else between the skirt of the cap and the tray deck. The bubble caps facilitate the continuous contact between the rising vapors and returning liquid. This range is widely used in various food, beverages, alcohol and chemical industry. 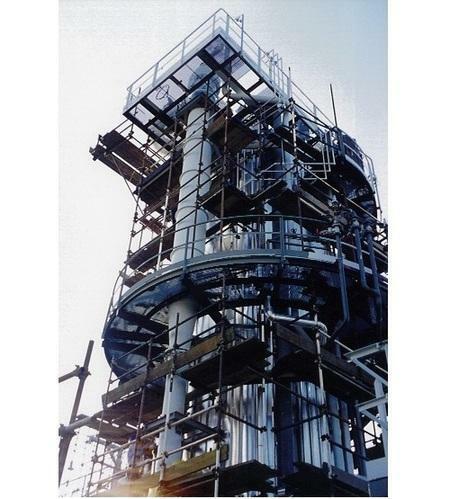 Banking on the technical expertise of our team of professionals, we have been successful in carving a niche for ourselves as a prominent manufacturer in the industry of supplying high quality Bubble Cap Distillation Column.